One of Sunday's highlights is reading Simon Wilde's excellent piece in The Sunday Times and it is therefore no surprise that I thoroughly looked forward to reading his book on Sir Ian Botham. Having prided myself in feeling that I know a good deal about the famous 1981 Ashes series having, at the time, been 16 years old and remembering everything vividly, I have found out an awful lot more from this book. Simon Wilde, to my mind, is one of the finest journalists around today and, like his articles in The Sunday Times, this book on England's hero and talisman of the late 1970s and 1980s, shows the depth of research which the author has gone to in making this a very fair and balanced account to portray the man who gave many of us so much pleasure. I have often found biographies more interesting and revealing than autobiographies and, in this excellent book, we learn, I feel, a lot more about Sir Ian Botham. His surprising vulnerability, perceived animosity towards the hierarchy and certain players from different areas who, in his highly confident way, he felt he was better than and Simon Wilde also goes into a lot of detail about various folk-lore stories which involved Botham: the brawl with Ian Chappell and his friendship with Sir Vivian Richards in his playing days amongst others. Everything is backed up coherently and no less than one hundred and one people who know or knew Sir Ian Botham have been consulted. These range from former players and team mates, family and media all adding to the balance of the book and giving us a different angle from what has been previously written. Sir Ian was also unfailingly helpful although, as Simon points out, this is a book written about him and not with him. That said in the last paragraph, I also found that other areas which naturally involved the player were also of tremendous interest. The regular references to Mike Brearley, both as a player and person and the influence of Botham in the late 1970s is described against the background of the woes of the country at that time ,being two. I also feel that Simon Wilde has tremendous statistical nous: I refer back to his Sunday Times articles but the statistics in this book not only at the end but the references throughout the book show what a tremendous grasp he has in bringing out more in everything which he writes about. This is shown, in the statistical section, not only in his Test record against every country but breaks down his Test and ODI career into three and four year spans. His Test record under different captains is both illuminating and fascinating. 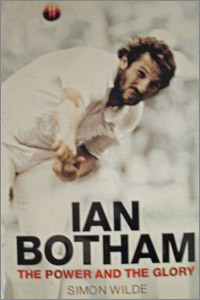 References to Botham's 1981 exploits within the text are equally illuminating: his greatest and most memorable performances - the majority of his unbeaten 149 at Headingley and 118 at Edgbaston and five for one spell at Trent Bridge - lasted around four hours. Four hours during which England could have gone on to lose 4-0 and ended up winning 3-1. Such is the command of Simon Wilde's writing and research. All the events both good and bad, on the field and off are mentioned in this book. Botham's family history, his fund-raising work which led to his knighthood along with cricket, and I cannot recommend this book highly enough. My only slight disappointment is that, having read three of Simon Wilde's books now, there have not been more. With luck, there will be.